This year the RHS have selected floral design collective La Famille to reimagine the celebrated Tunnel installation at the 2018 RHS Chelsea Flower Show. Entitled Natural Kinaesthesia La Famille's creative director Paul Malget will be creating a lush labyrinth of physical exchanges between man-made and naturally-crafted elements, moulding an interior landscape that takes its cues from wabi-sabi and celebrates the uncontrollability of nature. The installation references the tree lined streets of Savannah Georgia, USA with its indigenous, beguiling and unruly Spanish Moss. Supported by Visit Savannah the tunnel will emulate the beautiful canopies that adorn the streets, squares and parks around the city. Natural Kinaesthesia hosts an array of shade loving plants that are settled beneath a foliage based suspended ceiling. 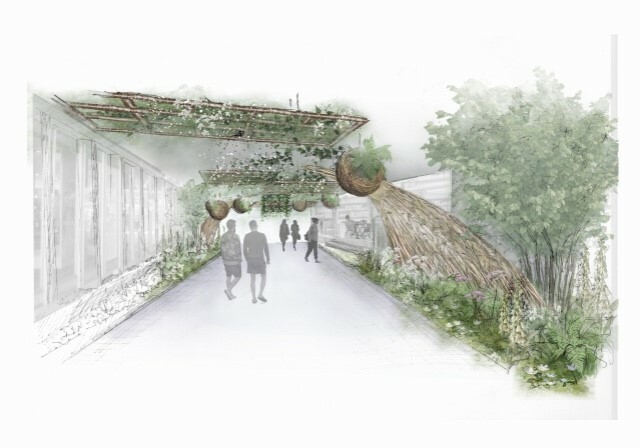 Visitors will follow natural hazel and willow arcs that sweep from floor to ceiling, and be met with a range of sculpted lanterns and orbs constructed by wood craftsman Guy Lambourne of Wassledine in Bedfordshire. The tunnel connecting Main Avenue and Ranelagh Gardens has been produced in previous years by florists and floral designers, most notably by artist Rebecca Louise Law (2015) and Joseph Massie (2016).